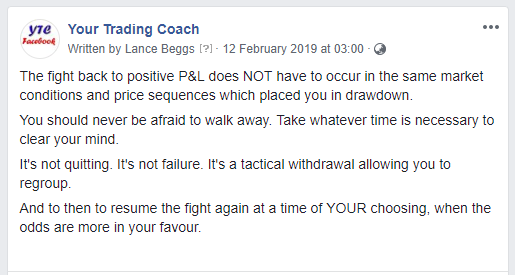 I sent the following post out via social media on Tuesday, prompted by some discussion with a trader who dug himself into quite a hole through doubling down on losses. This message is so important I thought I'd share it with my larger audience here in the newsletter. And also take the opportunity to expand upon the idea a little. This is one of the key advantages you have as a discretionary trader. YOU get to decide when and where you will play this game. If the current conditions are not to your liking, NO-ONE is forcing you to play. Take a break. Clear your mind. 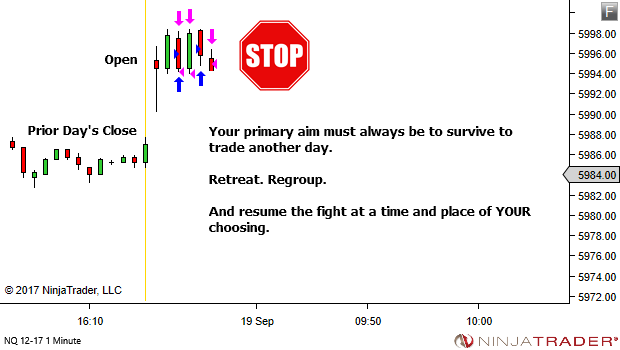 And come back at a time of YOUR choosing, when the conditions are more suited to your style of trading. 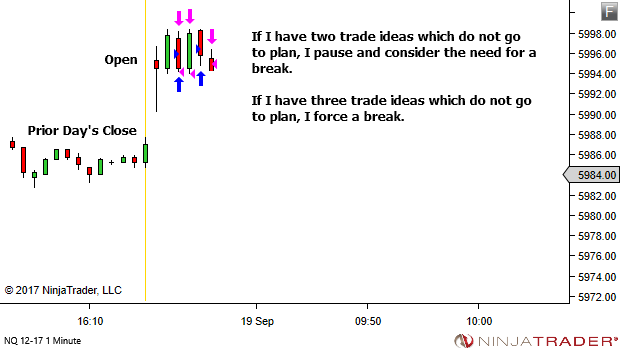 Schedule some time to review or amend your Trading Plan. 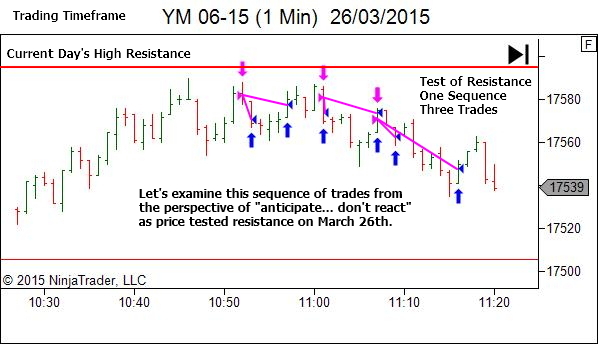 (a) At what point intra-session will you stand aside and force a break from trading? 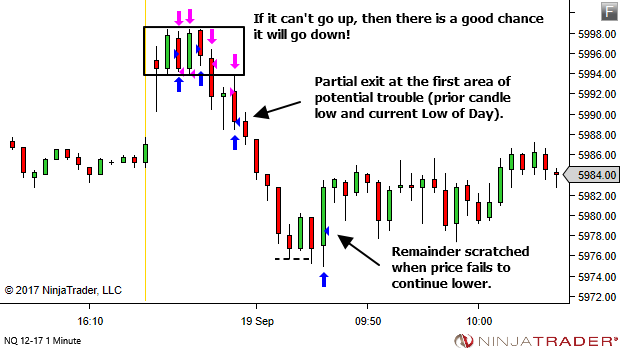 What changes need to occur before you will allow yourself to resume trading? 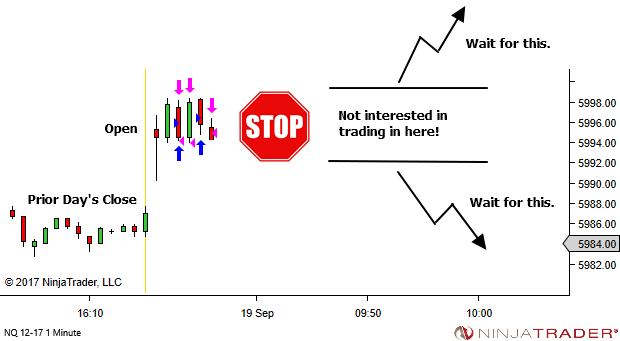 (b) At what level of intra-session drawdown will you force a stop for the day? (c) At what level of drawdown will you force a break from all trading, in order to review your performance and reconsider your plan? 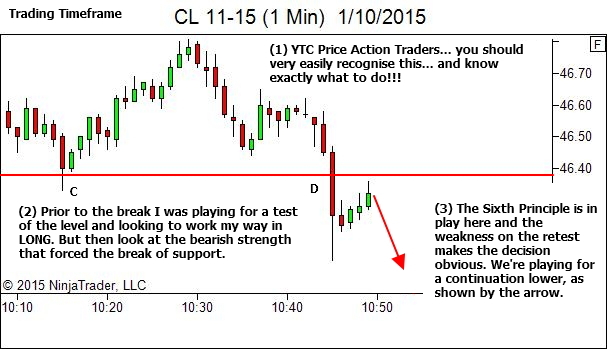 PS: For those concerned that trading should never be a fight… it's simply an analogy that I find particularly useful. 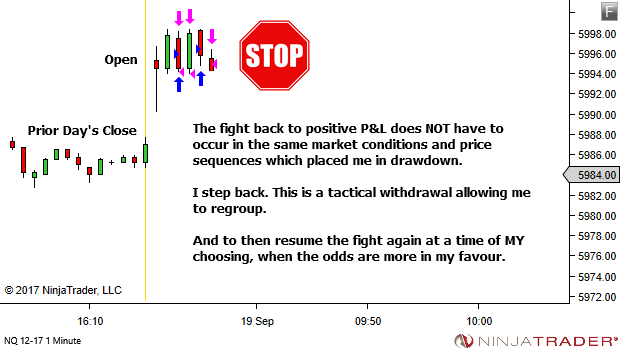 See here – http://yourtradingcoach.com/trading-process-and-strategy/trading-is-a-fight/ . The concept is still relevant even if you prefer to not view the game in this manner. 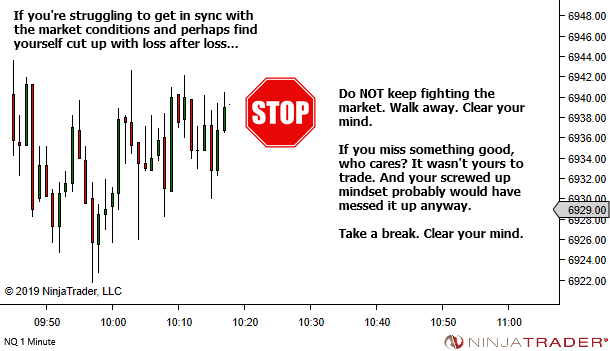 If you're out of sync with the market, step away. 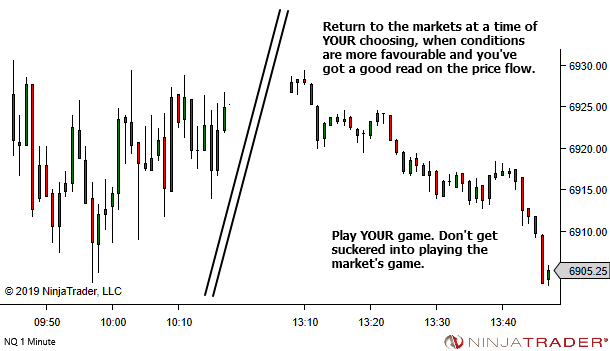 Come back and play at a time of your choosing, when the conditions are more suited to your style of trading and your preference for market conditions. You've learnt the pattern or setup. Great. But that's not trading. Now work on the real-time contextual decision making around that pattern or setup. Look beyond the pattern itself to the wider context. 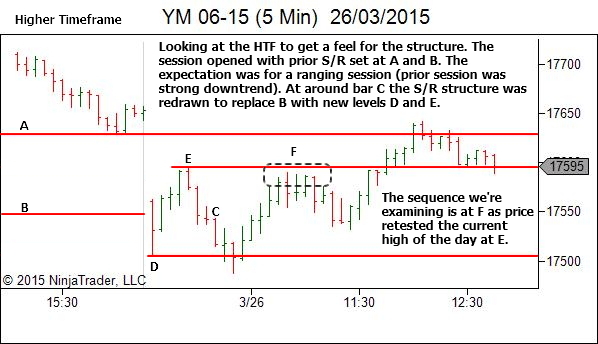 Where is the pattern occurring within the larger timeframe market structure? What structure will suggest avoiding this particular setup? What structure might suggest caution, or reduced position sizing? What structure might suggest increased odds and the potential to really press the trade for a larger gain? Where is the pattern occurring within time? Are there news influences which suggest passing on the trade? Are their time-of-day / week / month factors which might suggest standing aside? 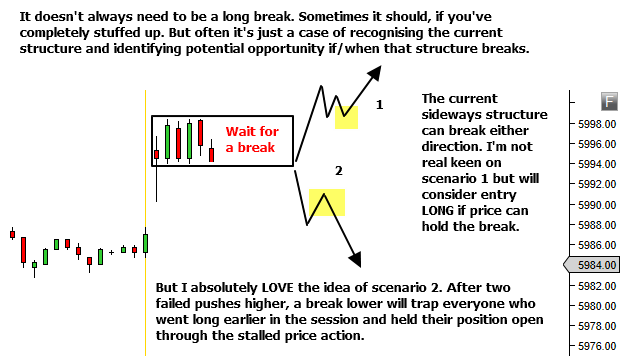 Consider the behaviour of price movement – the pace, the volatility, smooth vs choppy price action. What conditions might suggest adjustments to the default plan? All-in vs scaling in? All-out vs scaling out? Closer stops vs wider stops? Closer targets vs extended targets? 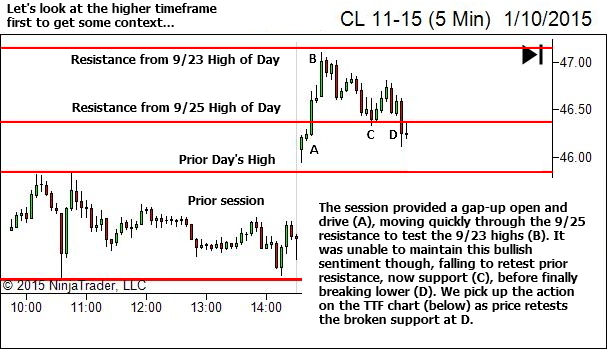 Consider the real-time decision making once in a trade. What signs might suggest a loss of edge? How will you react to this new information? What signs might suggest greater potential than originally perceived? How will you react to this new information? What conditions suggest a re-entry attempt should be taken, if stopped out of the position? And how many re-entry attempts are appropriate? 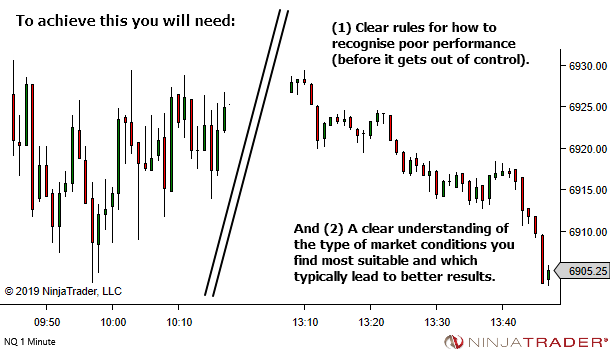 Trading is not about simplistic patterns. It's about real-time contextual decision making. If you've been on the wrong path then it's time to make a change. It's time to do the real work. 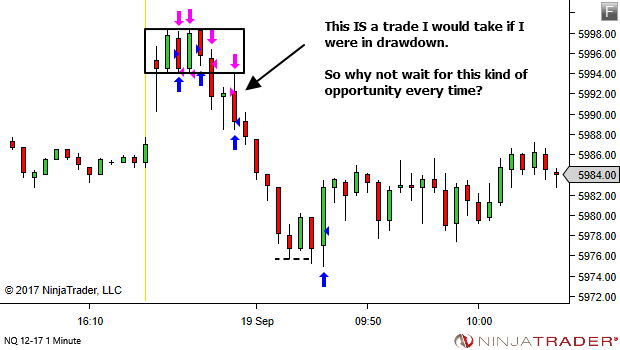 Is This a Trade You Would Take if You Were in Drawdown? Some of my better trades lately seem to occur after a string of marginal trades which either stop out or seriously underperform. 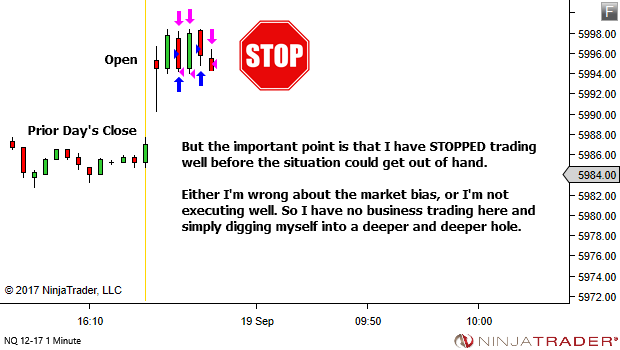 Mostly because of my rule which says that after two poor trades I need to step aside, clear my mind and reassess the situation. It prevents a downward spiral of emotional revenge trading. And allows me to return to the market with a new plan. 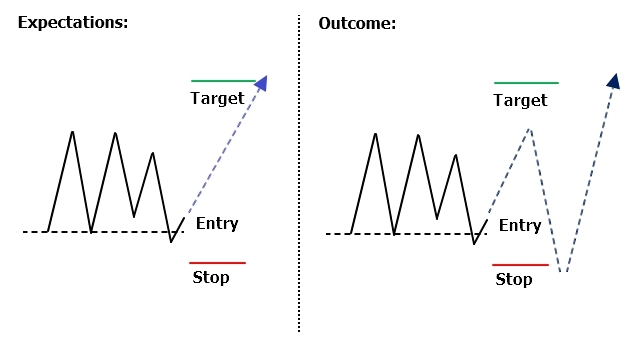 Usually, a plan which waits for a change of structure and takes the first pullback opportunity within that new market regime. So this brings me to an idea that may help me cut out some of the more marginal trades. 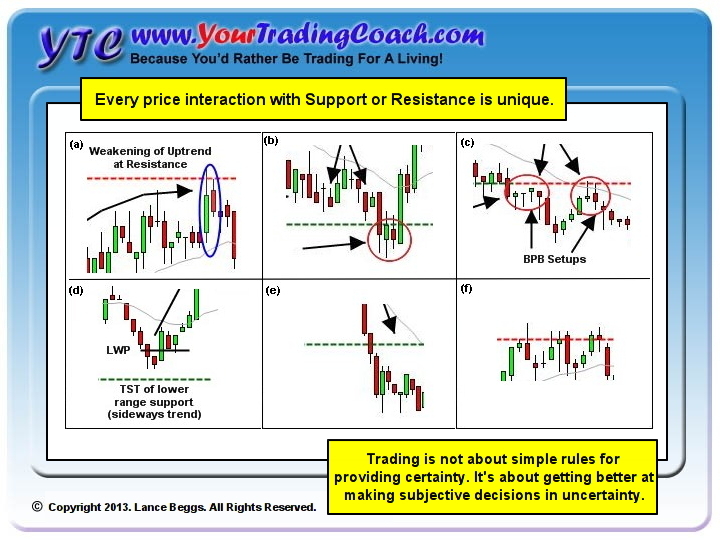 And perhaps may help you with improving your trade quality as well. Rather than waiting for two marginal trades to place me in drawdown, maybe I could trade "AS IF" I were already in that situation. "Is this a trade I would take if I were in drawdown?" But if not, maybe pause and reassess. Sometimes it will keep you out of a winner. That's how this game of probabilities works. 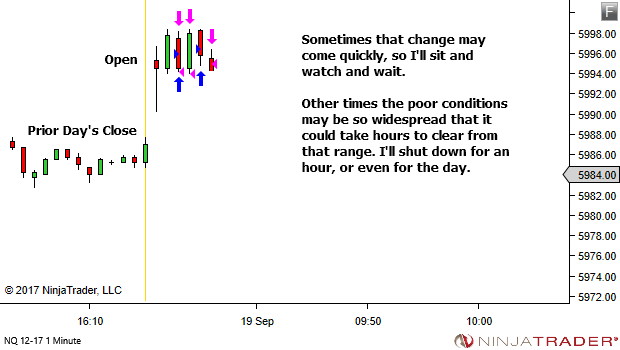 But if it's keeping you out of a number of marginal trades then there could well be a positive change to your edge. If the idea appeals to you, give it a try. But track the impact it has on your edge over a series of "avoided trades". If I could only take one trade this hour, would I be happy to make it this one? Of course, adjust the time to suit your style of trading. One trade per half-hour, per 4 hours, per day, per week… whatever suits your trade frequency is fine! 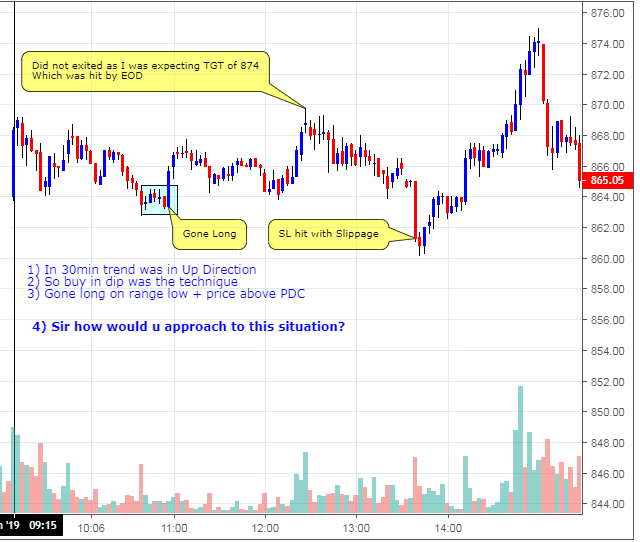 This question forces you to step back away from the excitement of the price action and the nervous tension associated with entry, and to briefly consider the quality of the trade. If the answer is an obvious YES… take the entry. But if there is any doubt… consider passing or waiting for more information. You don't have to take every trade. 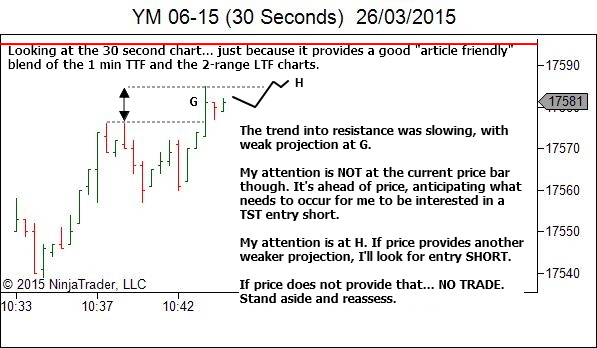 A question like this can be useful in filtering out the lower quality trades. Give it a try! So would I take this trade? 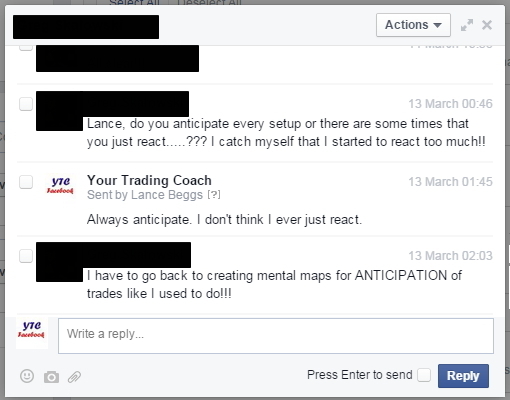 Here's a great question I received recently from another trader. Let's start by defining the terms, as it's obvious that any decision to enter must be a reaction to some "decision making input". But that is not what was meant. Do I anticipate every setup, meaning that it's pre-considered and pre-planned ahead of time before price gets to the area? For example… "The rally is slowing. 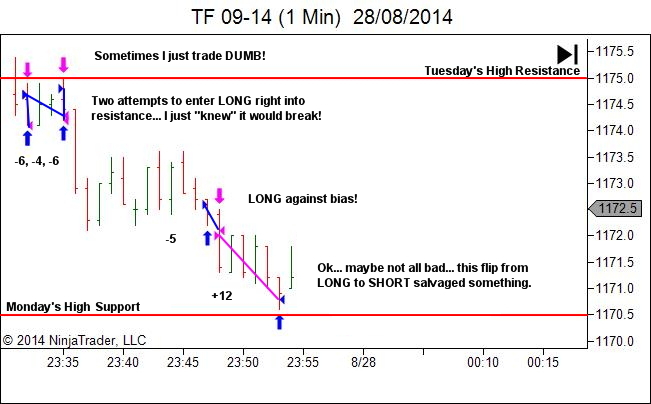 If we get weakness on a break of the next swing high I'll be looking to enter SHORT." 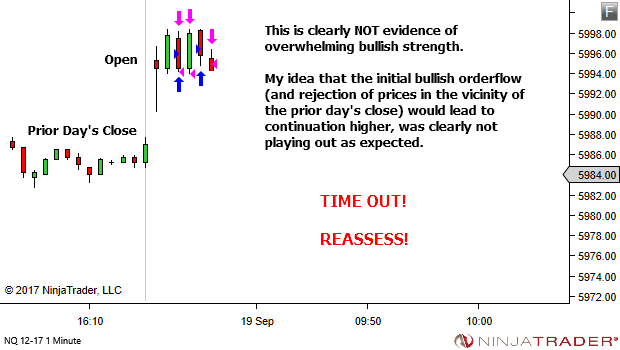 Or do I sometimes just react emotionally to the current price bar without any pre-considered thought and planning? For example, "Wow… that's a huge red bar… I'm getting in SHORT!". As I mentioned in response to the question… I always anticipate. Let's look at a recent example. 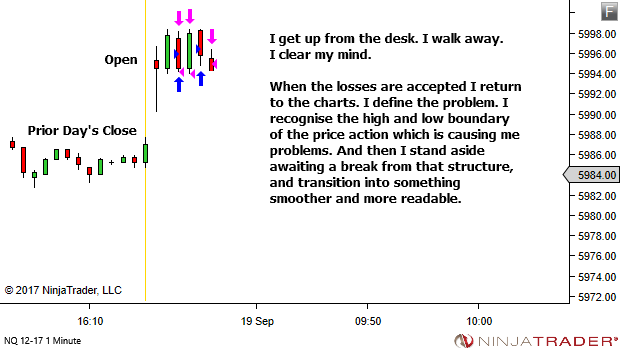 It's a sequence from last week which nicely illustrates the concept of "Anticipate – Don't React", showing how keeping my focus ahead of price ensures I don't chase or emotionally over-react to any sudden movement. 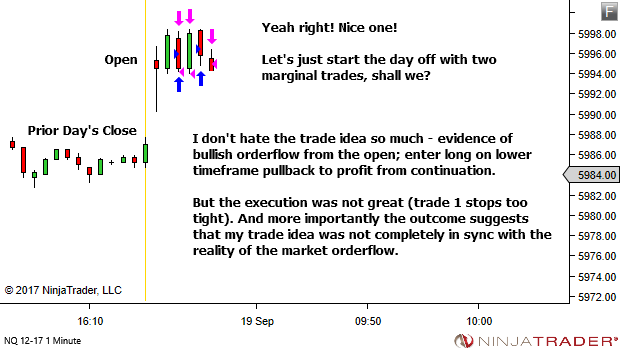 As a bonus it also demonstrates the idea that "sometimes a trade idea requires more than one entry attempt!" 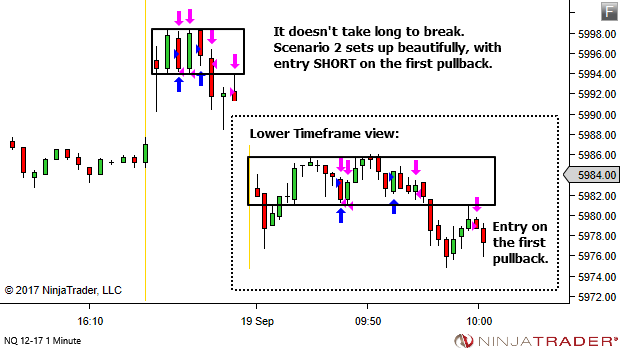 We pick up the sequence with price rallying up towards area F.
We'll view this sequence via the 30 second chart rather than the 1 minute (trading timeframe) chart. It provides a little more feel for the internal movement of the TTF and will make the article a little shorter than if I shared a combination of TTF and LTF each time (I'm all about saving time & effort!). No… not the naughty chair. This is not a punishment. Sometimes you just need to separate yourself from the screen. Get away from the computer. Get some fresh air. Relax and refresh the mind and come back to start again. Like a reboot for the trader! Well, my post-session review did consider this question. 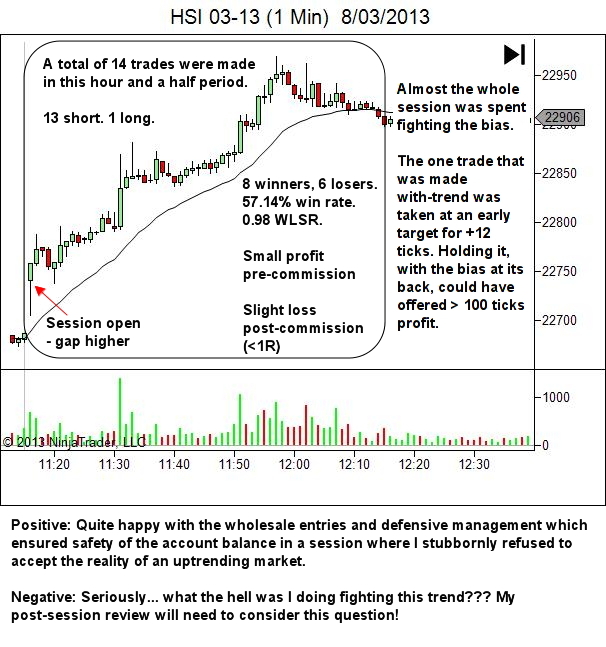 In fact, the answer was obvious to me even as I traded the session. I knew I was fighting an obvious uptrend from maybe the second or third trade, and yet I still didn't flip my bias and operate LONG.